Simple weekly homework to practice spelling or sight words. The spelling activities remain the same all year. The forms allows enough space for students who write large. Students can practice up to 12 words (10 words and 2 challenge words). 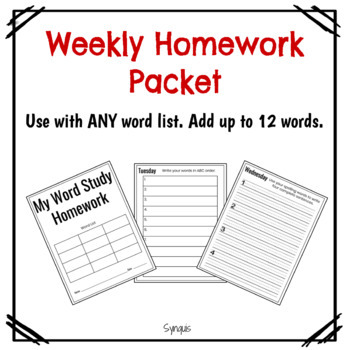 Have students write their words in on Monday or hand them a word list for the week Ideally, this would be culminated with a spelling test in class on Friday. . Due Friday.